Officer Dave Rodriguez appears to be clearly in the wrong and now back peddling by hiring a tax payer paid lawyer. 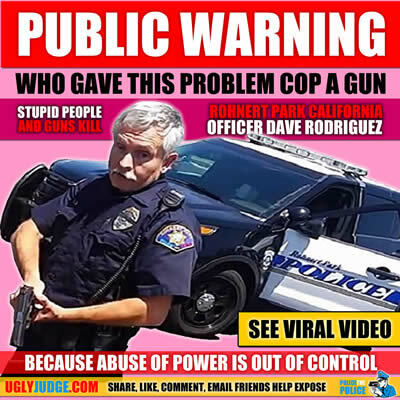 Its problem cops like this who make all police look bad and the cause of the public to lose trust and respect for good police. “The purpose of the brandishing of the weapon was apparent. It was to harass him, it was to intimidate him,” McComas’ attorney Jarin Beck said. A California police officer was caught on video drawing his gun on an unarmed man who was not accused of a crime or a threat has been placed on temporary paid administrative leave. If the above is true then why did it take a video tape and You Tube to get to this point? We all know had the victim gone to city hall he would have been ignored. However now that the entire city is looking bad they’re interested. In a Facebook post dated July 29, Rohnert Park resident Don McComas said he was in his driveway securing his boat to the back of his SUV when a police officer drove slowly past his house, stopped, then circled around and returned. At that point, McComas pulled out his cellphone and began recording. In the video, the officer Dave Rodriguez is seen driving toward McComas before stopping in front of his house. The officer then sits inside his SUV for nearly two minutes, and at one point, appears to be taking a picture of McComas with his own camera. As McComas approaches the patrol car to record the license place number, the officer exits the vehicle and tells him to take his hands out of his pockets. “No, sir. I’ve done nothing. I’ve done absolutely nothing. No,” McComas responds. That is when the police officer unholsters his firearm and points it at McComas, who asks him to “put the gun down.” The video shows McComas backing away while repeatedly saying “do not touch me” and asserting he did nothing wrong and did not have a weapon. “While some aspects of their contact were captured on video, Officer Dave Rodriguez is eager to share a complete accounting of the events which led to his contact with Mr. McComas as well as a complete description of what occurred during the recording,” said Doug Foley, the officer’s attorney. Get ready here comes the standard smear campaign tactics used by police when confronted with evidence they committed wrong. Find any dirt or make it up about the victim or person reporting. “Its the old, If you don’t like the message, kill the messenger” tactic. While the officer is on tax payer paid leave and able to take months to make up his story, claiming he can’t comment while there is an ongoing investigation. Only guilty people play this game and use this tactic as the truth never changes. As if there was something we did not know or see that makes what Officer Dave Rodriguez did OK? The incident began as Don McComas was loading up his boat for a day on the water when he noticed a Rohnert Park police cruiser stopped in front of his house. I was hooking the boat up when the officer pulled slowly into my court. When he rounded infront of my house he stopped yet did nothing, then crept forward and instead of leaving toward Snyder he rounded the court opposite of me, then stopped facing me for a few minutes, doing nothing but pointing straight at me/my house. After a couple minutes I was concerned enough to pull out my phone and hit record. Glad I did. Officer Rodriguez parked only a few feet away from McComas’ Excursion and just sat there in an overt attempt to intimidate an innocent man. After a few uncomfortable moments, the officer rolls down his window and begins filming back. Seconds later he jumps out of his car and begins to threaten McComas. Within just a few seconds of exiting his vehicle, the officer drew his pistol and began approaching McComas. Remember that McComas had done absolutely nothing wrong, a fact that this officer Rodriguez immediately admits upon contact. Despite McComas having the camera in one hand and his other hand up, posing no threat whatsoever, the officer continues his advance, with his pistol drawn. “When I saw the gun and comprehended what was happening I absolutely thought ‘they are going to kill me and claim my hand was in my pocket’ period,” said McComas. Is taking a picture enough to have reasonable articulable suspicion to not only stop at someone’s home but to pull a gun on them? (B) In all cases other than that set forth in sub-paragraph (A), a misdemeanor, punishable by imprisonment in a county jail for not less than three months.